After spending time carefully constructing your resume, and including detailed dates of employment, references from management and job responsibilities, nothing is more frustrating than being handed an employment application that asks for the exact same information. While you may be tempted to just write "see resume" or staple your resume to the application, if you want any shot at getting the job, resist the urge. 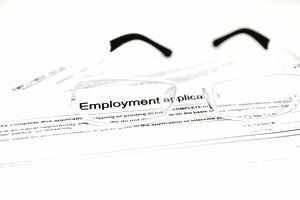 Employers know that job applications are redundant, but they're a pivotal part of the employment process that you need to complete in order to be considered for the position. Once you've had some practice filling out several employment applications, the process will become easy, although a bit tedious. Below are tips for using the employment application to your advantage. Download a free blank employment application sample and practice filling it out. That way you can be sure you're entering all the information you need, in advance. If you are applying for a position in person, ask for an employment application form and ask if you can take it home with you and complete it in the privacy of your home. This way you can take your time filling it out so it will be neat, legible, and accurate. Remember that employment applications for many companies are available online. For example, a Walmart Employment Application can be completed online for available positions. And Walmart is not alone. Many other large employers offer a similar service. In fact, some major national employers no longer accept paper applications and require all applicants to apply via their company website or submitting an application via an electronic job board. Online applications can take some time to type in the information and move from step to step, but try not to get impatient or sloppy. Be sure to double check your information to make sure it's accurate and remember to upload an updated resume and personalized cover letter. In some cases, you will be handed an employment application when you show up to interview. You will be required to fill out the form on the spot, which can make it tricky if you need to recall exact dates or phone numbers. It's completely acceptable to bring a cheat sheet with you when interviewing. A cheat sheet could be a sample application you already filled out or a document listing past employers' addresses, phone numbers, dates of employment, and reference information. Many companies put seemingly trivial instructions in job descriptions, such as "no phone calls" and "do not apply in person." Follow these instructions exactly; violating their rules shows you did not read the description, or worse, can't follow directions. While employment applications can be annoying and time-consuming, remember that they are a necessary part of the hiring process. If you are accurate, thorough, and follow all the instructions, it could lead you to a terrific new job opportunity. Employment application forms, free samples, templates, and suggestions on how to complete an employment application.